The public has sharply different reactions to major changes in Social Security and Medicare programs being proposed by some leading Republicans. While a majority favors a proposal to allow some private investments in Social Security, there is considerably less support for the idea of ending Medicare and replacing it with a system of vouchers for purchasing private insurance. The latest Pew Research/National Journal Congressional Connection poll, sponsored by SHRM, conducted Sept. 9-12 among 1,001 adults, finds that 58% favor a proposal that would allow workers younger than age 55 to invest a portion of their Social Security taxes in personal retirement accounts that would rise and fall with the markets; 28% oppose this proposal. Majorities across all age groups — except for those ages 65 and older — favor this proposal. 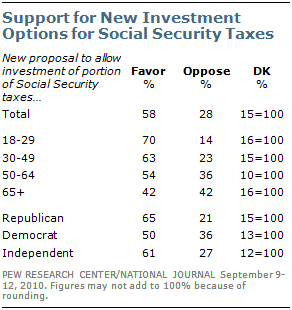 Among senior citizens, as many favor (42%) as oppose (42%) allowing private investments in Social Security. By contrast, fully 70% of those younger than age 30 favor this idea. Support for the general concept is comparable to support for a similar plan advocated by former President George W. Bush in 2004. As he sought reelection in the fall of 2004, 58% of registered voters that September favored allowing younger workers to invest a portion of their Social Security; 26% said they opposed this change. However, after Bush won reelection and debate about the proposal began, support weakened. By March 2005, the public was largely split (44% favor, 40% oppose) and the proposal was not enacted. Meanwhile, just a third favor replacing Medicare — the government program that provides health care to seniors and people with disabilities — with a program that would give vouchers to Medicare recipients so they can purchase private health care insurance. About half (52%) oppose this idea. 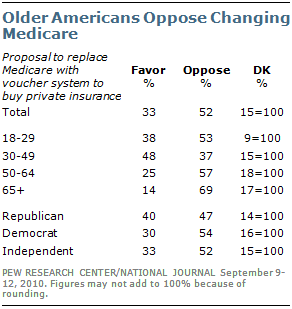 Age also is a factor in opinions about changes in Medicare: Fully 69% of those 65 and older oppose replacing Medicare with a private voucher system — the highest percentage of any age group. Those ages 30-49 are most supportive: 48% favor the idea, while 37% oppose it. 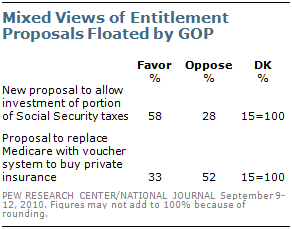 Even among Republicans, there is more opposition than support for replacing Medicare with a voucher system. Nearly half of Republicans (47%) oppose this proposal, as do 52% of independents and 54% of Democrats. On other issues, public attitudes about the sweeping health care legislation enacted earlier this year have changed little since early July. Currently, 38% say they approve of the legislation, while 45% say they disapprove. When those who oppose the legislation are asked whether it should be repealed as soon as possible or given time to see how it works, nearly a third (32%) of the total sample say the law should be repealed. Nearly eight-in-ten Republicans (79%) say they disapprove of the health care law — and more than six-in-ten (63%) say it should be repealed. Among Democrats, 69% say they approve of the law, while 15% disapprove; just 8% say it should be repealed. Independents largely mirror the public as a whole: 34% approve of the law, while 48% oppose it. A third of independents say the law should be repealed. Americans are divided about whether to preserve the constitutional provision that makes all children born in the United States citizens, regardless of their parent’s immigration status. Currently, about half (49%) say the Constitution should be left as it is, while 46% say they favor changing the Constitution to prevent children from automatically being citizens at birth if their parents are not in the country legally. A majority of Republicans (56%) favors amending the Constitution, while 39% oppose this. Among Democrats, 53% oppose making this change, while 41% support it. Independents are very much like the country as whole (45% say yes, 50% say no). With debate in Washington heating up over whether to continue the tax cuts enacted during George W. Bush’s administration, public opinion remains divided. About three-in-ten (29%) say all of the tax cuts should remain in place — the position of GOP leaders in Congress, while the same percentage (29%) say tax cuts for the wealthy should be repealed while those for the less affluent remain in place, the position taken by the Obama administration; another 28% say they think all of the Bush-era tax cuts should be repealed. The latest Pew Research/National Journal Congressional Connection poll, sponsored by SHRM, conducted Sept. 9-12 among 1,001 adults, finds little change in public opinion about the tax cuts since July. 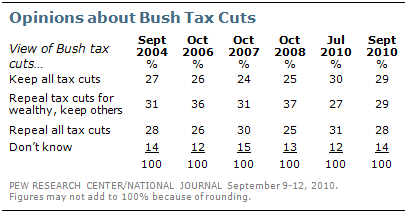 A plurality of Republicans (47%) support keeping all of the Bush tax cuts; just 16% of Democrats do so. Democrats are somewhat divided between supporting repeal of the tax cuts for the wealthy — while maintaining those for everyone else (40%) — and supporting repeal of all the tax cuts (32%). Independent opinion is divided among the three options (30% keep all tax cuts, 28% repeal only those for the wealthy, 31% repeal all the tax cuts). 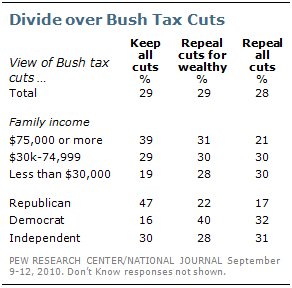 Those with higher annual family incomes are more inclined to support maintaining the Bush tax cuts in their current form. About four-in-ten (39%) of those with incomes of $75,000 or more say all of the cuts should be maintained. By comparison, about one-in-three (29%) of those with incomes between $30,000 and $74,999 say this, as do just 19% of those with incomes of $30,000 or less. As the midterm election campaign heats up, the public continues to see no clear leader atop the Republican Party. Only a quarter offer a name when asked who they think of as the leader of the party these days. More than half say they do not know and 18% volunteer that “nobody” leads the party. Those numbers are little changed since the question was last asked in April. The latest Pew Research/National Journal Congressional Connection poll, sponsored by SHRM, conducted Sept. 9-12 among 1,001, finds that Arizona Sen. John McCain and former Alaska Gov. 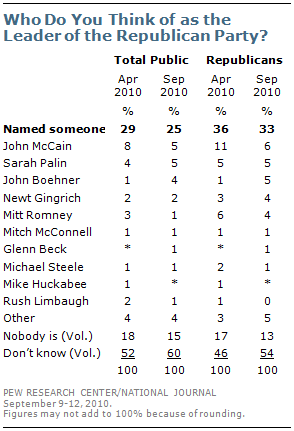 Sarah Palin each are mentioned by 5% of the public. Beyond the 2008 presidential ticket, another 4% mention House Minority Leader John Boehner, who could become speaker if Republicans take control of the House in the elections. Mentions of Boehner have risen from 1% in April. Among Republicans, a third (33%) offer a name, but more than half (54%) say they don’t know and 13% say nobody is the current leader. The most frequently offered names largely match those offered by the public as a whole: 6% offer McCain, while 5% each name Palin or Boehner. Just 1% offered Boehner in April. Another 4% each mention former Massachusetts Gov. Mitt Romney or former Speaker Newt Gingrich.